Now you can Convert Whats App Voice Messages to Text using the simple tool that will help you to easily convert the files. So have a look at the complete guide discussed below to proceed. Whats App is one of the most popular social media out there and the users all around are crazy for this smart communication tool. This tool has been made with a lot of care and is filled wholly by a number of useful features by the developers. One of the aspects about this smart social conversational app is that the users could conveniently share most of the types of files with the added users. They could also chat with their friends through different modes like text, video calling, voice calling, share voice messages, documents etc. One of the easiest ways to chat with the friends is to send them the message through your voice on the Whats app. What they have to do is to open up the voice message and then hear it see what message is delivered to the other end user. This could not be the best way for some of the users to just recognize the message through hearing, they would be liking to see the message through the direct text. Actually, there is a possible way through which the voice messages in the Whats app could be transformed into text. Yes, you heard it right and for the same description, we have written the whole process in this article. If anyone of you is curious to know how the voice messages inside the Whats app could be transformed into text then they must read the whole information of this post till the end! ➤ First of all, you will have to download a kind of app on your device on which you are running the Whats app. The app is Transcriber for Whats app. Just install it on your device and then move ahead to the next step. ➤ After you have installed the above-stated app and set it all, just open the Whats app on your device and then open the chat where you wish to convert the voice message into text. Note that you could freely use any of the conversation inside the Whats app for changing the voice messages. Once you have located the voice message you wish to work on, select it and then long tap over it. ➤There would be a number of options arising after you long press over the voice message and from those options you need to tap on the Share option. From the list that appears for sharing of the voice file just select the Transcriber option. The app will then automatically convert the voice file to text and then show it to you on the screen. There will be nothing else you will have to do! ➤Download and install Audio To Text For WhatsApp on your iPhone. You could find this app easily in the store or even on the internet so just go ahead and download it to your device. ➤Simply select the Voice Message from the Whatsapp and just share it to the Audio To Text app you just installed in the above step. You will be redirected to the text form of the message so that you can be able to easily read it out. 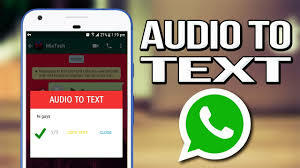 After reading all of the information provided in the above article you have got to know about the best possible method to convert the voice messages inside the WhatsApp to the real text that you could understand properly. While we were crafting this page and embedding it with the information our focus was to provide the audience or the readers with the more focused and pointing information filled with only the relevant details. Through our motivation and the hard work, we have just provided you with a unique kind of tech information in the above article. We hope that you would have liked to read and also you might have grasped the proper knowledge out of it. If you really liked the information in this article then please take some more time to share it with others. Also, tend to write inside the comments section, we would definitely like your indulgence through your opinions or the suggestions!